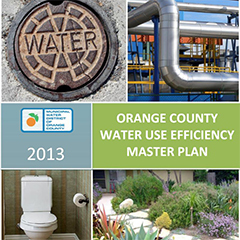 In May 2012, the Municipal Water District of Orange County began developing a Water Use Efficiency Master Plan (Master Plan) for Orange County. The purpose of the Master Plan is to define how Orange County will comply with, or exceed, the state mandate of a 20 percent reduction in water use by 2020, and how we will achieve our share of Metropolitan’s Integrated Resources Plan water savings goal. The Master Plan is designed to achieve the water savings goal at the lowest possible costs while maintaining a mix of programs desired by water agencies and consumers throughout Orange County. After a year-long stakeholder-supported process, the Water Use Efficiency Master Plan was approved by the MWDOC Board of Directors.